EMC – Where are Mailbox Total Items & Size (KB) Columns? You would have noticed that you are not able to see the Total Items and Size (KB) of user’s mailboxes in Exchange Management Console of 2007. Even you are not able to add columns optionally. Like you were able to see in Exchange System Manager of version 2003 displayed below. Now question is where to see/add those options… Your answer is run the PowerShell command to see those options. When I run below command in Exchange Management Shell for Database name “Mailbox Database”, it gives similar output to ESM 2003. Only difference is it shows size in Bytes instead of KB. Now if I want to export this into CSV the I need to run below command. Now lets say I want size in MB then I need to run below command. If I want to sort this report by Mailbox Size then I need to run below command. In these examples we got reports for database “Mailbox Database” in same way we can get it for whole server with below command. Gee…this seems so simple…why, oh why, did M$ leave this out of the GUI? On that note: are there any good 3rd party PowerShell GUI apps out there, or do I have to beg one of my programming buddies to write me one? You know…something that would come with a bunch of these “missing” commands pre-loaded with the ability to create new ones, while presenting the whole she-bang to you with pretty cornflower blue buttons? Thanks GoodThings. You know that is all anyone is looking for in the end. 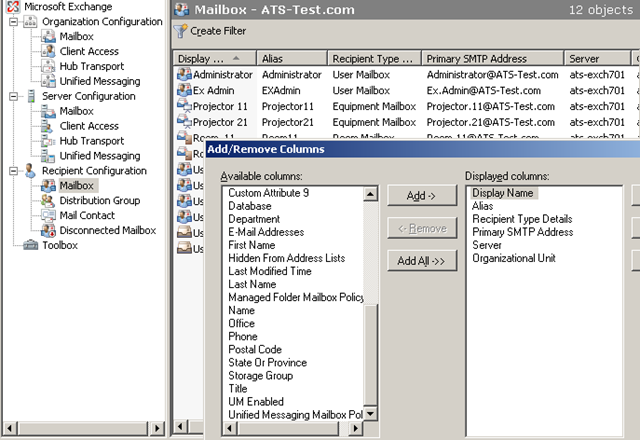 Exchange 2007 and mailboxes size list ? Tried it and it seems to list out all maiboxes from all stores and databases, even if I specify only the one database. Great for some purposes, but not all. I really don’t understand what Microsoft was thinking with some of their Exchange 2007 decisions. So allowing people to do things via either a GUI or a command line is GOOD. But taking away things that they used to be able to do graphically and forcing them to do it via command line is BAD. This is along the lines of the decision to take away the ability to create users with mailbox via ADUC. This generates more work for sysadmins–not less. It’s a step backwards. Whomever made these design decisions has lost touch with Microsoft’s customers. Agree with Bucket – a lot of frustrations! MS was so proud of Exchange 2000/2003 – finally they got rid of two databases (AD and Exchange). Now they decided to return back to Exchange 5.5 era!? ?